It is a vulnerable making process to write to a father who has been absent from my life for over three decades—an absence that has required me to listen, and therefore write, in a new way. The collection, dear Gerald, is me talking to the silence, out of it, around it, but always aware that it is there, unknown and important and a critical part of my personal history. I know a smattering of details about my father, Gerald. His father and brother were in the police force, and from my research on Guyana, the police force is a paramilitary arm of the government. The “epistol” evokes this family history. Maybe I need a pistol on this journey; one that’s loaded with words and unexpressed emotion, and when the trigger is pulled, my voice is liberated. Ringing through the air, announcing I am here. There is a report. Father, do you hear me? into you on Nostrand Ave.
so he can make a sail. sky-sure when seeing my departed. My mother asked me the day of my 33rd birthday if I wanted to write my father in Guyana, his homeland, where he was deported for involvement in a criminal case. She had an address. My father is part real and part mythology for me—he’s made up from a pastiche of stories, collected from others. What to say to a man who is my father and my imagination? dear Gerald is biomythography, a term coined by poet Audre Lorde to describe her book Zami. Ted Wharton describes biomythography as “weaving together of myth, history and biography in epic narrative form, a style of composition that represents all the ways in which we perceive the world.” The intertexuality of the genre provided an approach for translating the degrees of silences nestled inside me, the preverbal unsaid and things I’m afraid to say. 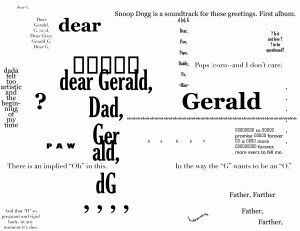 There are typographical poems, prose is used, free verse and formal, and references to the Torah, Obama’s 2012 election speech, popular culture, mensuration, oh my. Addressing these poems to my father, a patriarchal and absent figure—the model for all our governance—is an act of empowering myself and holding my lived experiences as universal truths. I put myself at the center of the narrative, as well as those like me, and I’m transformed by this shift in consciousness. I declare my presence with the force that made abandonment possible. I’ve learned my power. Father, you will see me. I will speak in metaphors, lyrically, subject-verbs in disagreement, from the vestiges of English creole you left in my three-year-old ears. My father, as an audience, called up fear. A fear of rejection, primarily for being a queer woman in an interracial relationship, and I would hit up against that anxiety when I started to write about my romances. I have a natural impulse to share, unless I’m fearful in some way, and therefore don’t feel safe. It became all those homophobic voices I heard, especially from those closest to me like, “We don’t need to know who you sleep with,” yet all around us children and the heteros that made them. The same kind of anxiety when talking about getting my period—the feminine/queer details of my life felt taboo and there was the protective urge to quiet them. When you speak up or speak about yourself, you talk back to all the narratives that have mastered you, so that you can be centered in a voice of your own authority. I countered the censors with “What is there to lose? He’s been out of your life longer than he’s been in it;” as well as made connections through cultural and personal history, using what little I knew about him to mend the foundation of our relationship. In the end, what took priority was creating an honest portrait of a poet and a woman. Why do I partner up with women who can’t find their things? These aren’t things they seldom use—these are objects for the daily. and I’ve a strategy for bringing them back into my possession. to get stressed out, neck tight, and shallow breaths to look for what’s mine. and I ask, Are you my daddy? 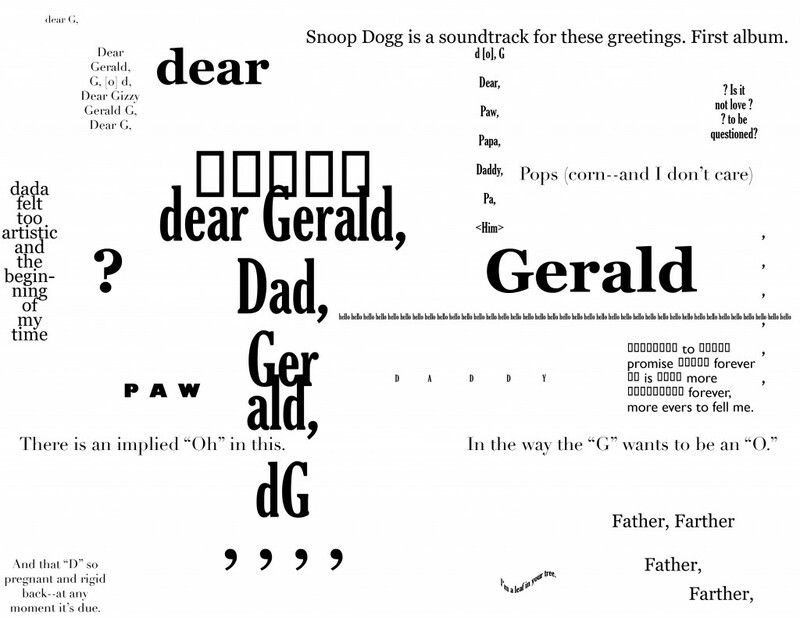 Send me your “epistols”: I know there are others who are estranged from their fathers, who are bastards, forgotten, or who have lost a father who was never present, and I want your letters in exchange for a copy of dear Gerald. Seriously. Your “epistols” will be inspiration for a second collection, which I’m considering to title: Who’s Your Daddy? Visit http://atoguyana.wordpress.com/dear-gerald-letter-submissions/ to learn about how to submit. Arisa White is a Cave Canem fellow, Sarah Lawrence College alumna, an MFA graduate from the University of Massachusetts, Amherst, and author of the poetry chapbooks Disposition for Shininess and Post Pardon. One of the founding editors for HER KIND, an online literary community powered by VIDA, she is a Kore Biters’ columnist at Kore Press. 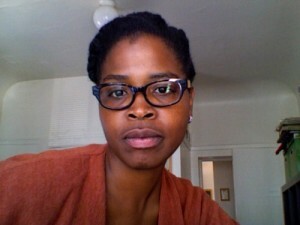 A native New Yorker, living in Oakland, CA, with her wife, Arisa is an advisory board member for Flying Object and a BFA Creative Writing faculty member at Goddard College. She was awarded a 2013-14 Cultural Funding Grant from the City of Oakland to create the libretto and score for Post Pardon: The Opera, and received, in that same year, an Investing in Artist Grant from the Center for Cultural Innovation to fund the dear Gerald, A to Guyana, project, which takes a personal and collective look at absent fathers.